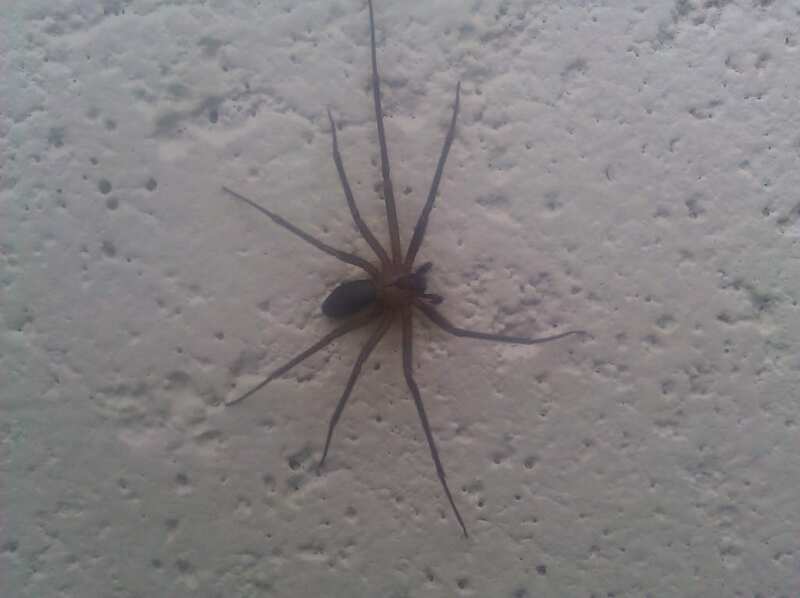 Have Brown Recluse Spiders? Want them Gone? 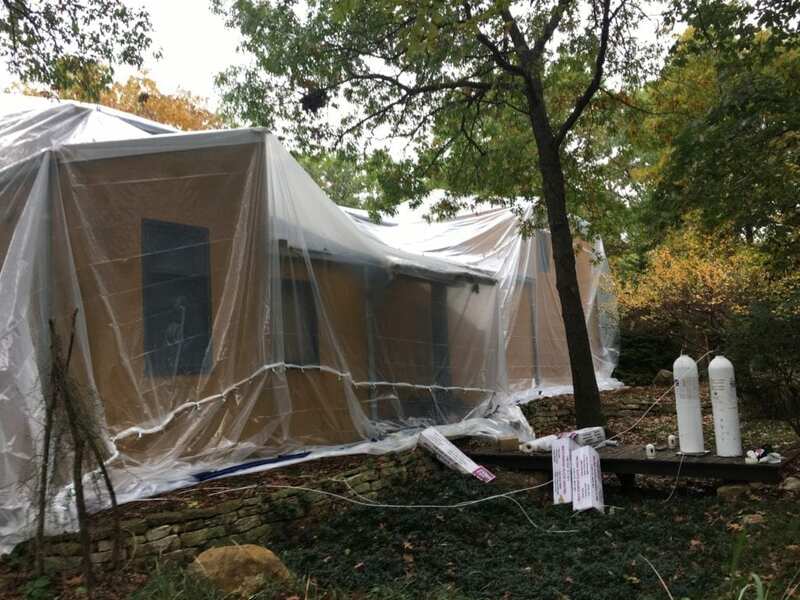 No worries, let us tarp your home and insert Vikane Gas into your home to kill all stages of Brown Recluse Spiders in your Kansas City home. We have the ability to kill all stages of Brown Recluse in your home in as little as 3 to 5 days using one treatment method, Vikane gas. The brown recluse, Loxoceles recluse, is the most publicized and feared spider in the Greater Kansas City Area. The venom from the brown recluse is hemotoxic and causes nacrosis of the tissue. A bleeding, ulcerous wound which takes a long time to heal in the young and elderly. The wound can be prone to secondary infection if not treated properly. The brown recluse thrives in and around human structures. Most homes in Kansas and Missouri have brown recluse spider affecting their structures. The brown recluse spider in Kansas City is a medium-sized spider about the size of a quarter. The brown recluse is covered with short hairs and has six eyes arranged in a semicircle. Magnification may be necessary to see the arrangement of the six eyes. A violin-shaped marking may be the most distinguishing characteristic of the brown recluse wether young or old, male or female. The neck of the violin points towards the abdomen (rear) of the spider. Depending on temperature the brown recluse can develop from egg to adult in 8 to 15 months. The brown recluse in relatively durable, and long-lived, usually lives about 2 to 3 years or more. Female brown recluse spiders construct up to five egg sacs, each egg sac containing 20 to 50 eggs. Egg sacs can be found attached to walls and other surfaces including plants, boxes, and furniture. After 3 to 5 weeks spiderlings emerge and remain in the web, with the mother for 2 to 3 skin sheddings before looking for their own suitable habitat. The new spiderlings shed (molt) six or seven times before reaching adulthood. The brown recluse spider feeds on insects which include other spiders and arthropods. The brown recluse does not construct webs to capture its prey. The brown recluse uses a bite and retreat method, coming back to consume its prey later. This spider is a quick and active hunter, prefers to move around and hunt at night. The brown recluse spider usually hides in dark areas undisturbed areas like under boxes, in piles of books and papers as well as furniture. Night time is when this spiders uaually starts to roam in search of food. This spiders starts to look for dark hiding places such as piles of clothing, shoes, toys or anyting laying on the floor as daylight approaches. In homes with considerable clutter and stored items this spider can be more common. Also with homes that are older where natural aging and settling occurs due to settling cracks and crevices. The brown recluse searches out warm, dry habitats with little air movement and low light, this includes attics and upper rooms. This keeps the spiders out of sight and away from living spaces. If those areas become too hot or food becomes too scarce they will relocate to other parts of the home. Brown recluse spiders generally don’t bite humans unless as a defense when trapped against the skin. If bitten the reaction to the bite from brown recluse depends on the victim’s health. The amount of venom injected, the spiders size and the bite location makes a lot of difference on how humans react to the brown recluse spider bites in Kansas City. In rare cases the venom from brown recluse may cause a life-threatening illness. The bite is usually painless and the victim is not aware of being bitten until signs start to show. If you have been bitten by brown recluse spider in Kansas City apply ice to the location and consult with medical care professionals. Treatments vary and early diagnosis is important. If possible capture the speciman to show to the medical professional. Unless you use Vikane gas for complete fumigation of your home, eliminating brown recluse spiders from your structure may be difficult. Using an integrated approach to eliminate harborages is moving in the right direction when trying to control brown recluse spiders. Remove clutter, from your home starting with the attic, upper rooms, main level and basement. Frequent use of a vacuum wand reaching between boxes and other tight spaces will help eliminate spiders, their egg sacs and potential food sources is key. Sticky traps can be used to monitor brown recluse spiders. These can be found at any local hardware sotre. Traps can help monitor and control populations. Place the traps around the home in areas where spiders are likely to travel for better results. The use of liquid chemistries to control brown recluse spiders is limited.